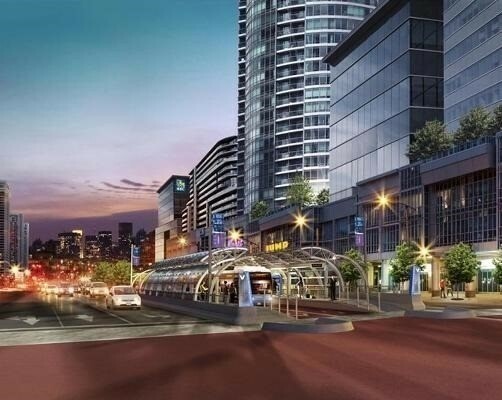 This is YOUR opportunity to own a 1 bedroom plus den, 2 bathroom condo in the FIRST building located by a Subway in Vaughan as well as a 20 acre park. With access to major highways and transit, you will be just minutes from some of city's favourite and best shopping, entertainment and education including, Vaughan Mills, Wonderland, Theaters, Restaurants and York University. The beautifully designed building in a unique quadrangle shape features resort like amenities including, a Fitness centre, Yoga Studio, Spa with Whirlpool, Steam-Room and Sauna, Theatre Room, Tech Lounge and Games Room. If that is not enough you can also unwind at the bar and lounge or enjoy a BBQ with friends and family in the BBQ lounge. There is something for everyone. This building with its many features and location does not disappoint!